This dialog box brings all the typography options at one place. You can change the text styles of individual elements. 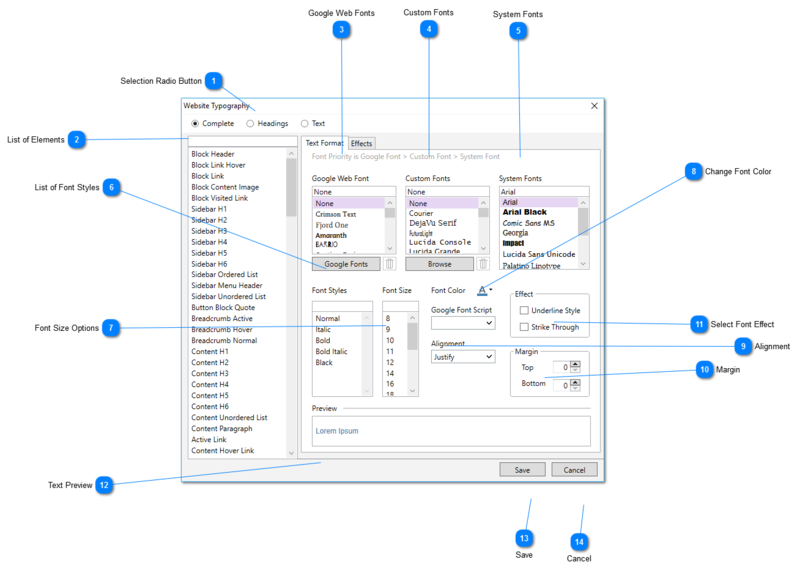 Complete – You can customize the typography for any element from the list given in the extreme left of the window. Headings- It will let you to specify the typography of headings only while making the list of elements inactive. Text- It will allow you to define the styling of text only. From this list, choose the element whose text style you want to change. From this list, you can select any Google font for your website. To browse more fonts online, Click “Google Fonts” button. This is the list of custom fonts, you can select a font from this list. Click ” Browse” button to browse more custom fonts. 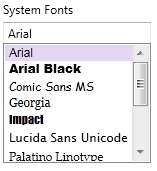 If you want to use a system font for your website, you can select a preferred font from this list. You can choose a preferred style for chosen font from this list..
From this list, you can choose suitable size of the font. You can choose a suitable color of the text with this tool. Modifies the alignment of the text. According to the need of your template/website, you can set the alignment of the text. Specifies the margin of the text. To choose an underline or strike through style for the text. You can preview the text style from here.